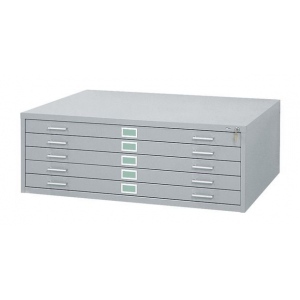 Safco Steel Flat File: 5 Drawers, 16 1/2" x 53 3/8" x 41 3/8"
Classic modular files featuring electrically-welded heavy-gauge steel construction double-thick wraparound corners integral cap and sturdy inner frames. 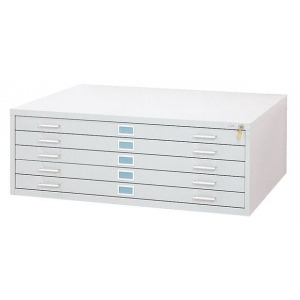 * Five-drawer files store up to 500 sheets per unit active filing 750 sheets semi-active and 1000 sheets inactive. * Ten-drawer files allow for easy retrieval of materials with ten separate 1" deep drawers. * All files stack securely up to five units high with anti-slip pads between units to eliminate shifting. 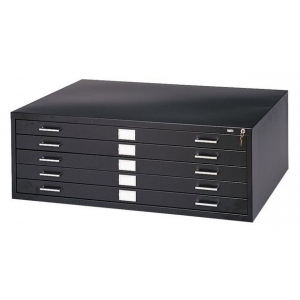 * Additional features include museum/archival-quality paint finish steel side roller assembly with case-hardened ball-bearing rollers for smooth drawer operation rear bumper pads drawer safety stops heavy-duty drawer rails for precision alignment rear drawer hoods and hinged front depressors.5-drawer file in black color. * Overall dimensions: 16 1/2" x 53 3/8" x 41 3/8". * Inside dimensions: 50" x 38". * Drawer files only no base.